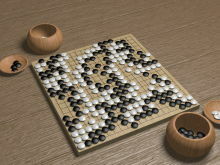 Sensei's Library is a collaborative web site about and around the game of Go (also called Igo, Weiqi, or Baduk). It is a repository, a discussion medium, it is the pot of Go(ld) at the end of the rainbow! SL is whatever you make of it. See Find Page for more options or start searching diagrams. Find out What Go Is, visit the Pages for Beginners or go straight to the Beginner Study Section. Go to the Reference Section or other Starting Points. If you have any questions, don't hesitate to enter them in the Quick Questions or message board pages. Anyone (and we mean anyone) can add or edit pages. There is no requirement to register a username / password. Learn how to use Sensei's Library and try it out in the SandBox. Tell us about your local club, a nearby tournament, or about yourself. Have a go book you like? Give us your book review! Right now Sensei's Library contains 22538 pages. 2 pages edited during the last 24 hours.